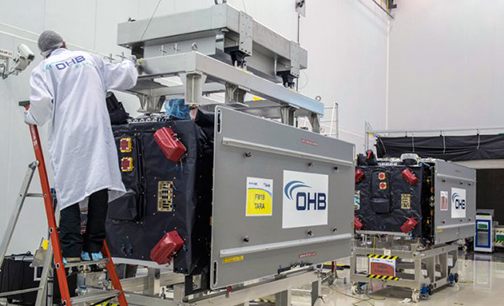 Payload preparations have started for Arianespace’s next Ariane 5 mission in support of Europe’s Galileo global navigation system, with two of the four satellites for launch on this July 2018 flight now undergoing their checkout at the Spaceport. These two spacecraft arrived at French Guiana’s Félix Eboué Airport earlier this month aboard a 747 cargo jetliner, and were then unloaded and transported by road to the Spaceport’s S1A payload preparation facility. The third and fourth Galileo satellites will be delivered to the equatorial launch base in June. Two of the four Galileo satellites for Flight VA244 are shown inside the S1A payload preparation facility after being removed from their protective shipping containers. Arianespace’s upcoming mission — designated Flight VA244 in the company’s launcher family numbering system — follows two previous Ariane 5 flights at the service of Galileo which delivered four satellites each to medium-Earth circular orbit in November 2016 and December 2017. Previously, Arianespace launched 14 Galileo spacecraft in pairs aboard medium-lift Soyuz vehicles. The civilian satellite navigation system for Europe Galileo is Europe’s global civil satellite navigation system, providing positioning with great precision and reliability. The program is funded and owned by the European Union, with overall responsibility for management and implementation held by the European Commission. Flight VA244 is to use an Ariane 5 ES version of the heavy-lift workhorse, equipped with a storable propellant upper stage. The vehicle will deploy its satellite passengers at a targeted orbit altitude of 23,222 km. Design and development of the new generation of systems and the technical development of infrastructure are entrusted to the European Space Agency, while the Galileo spacecraft are built by OHB System in Bremen, Germany, and the navigation payloads provided by Airbus-owned Surrey Satellite Technology in the United Kingdom.